Technospex’s uRaman is a micro-Raman system that possesses high spatial resolution, which is imperative for Raman measurement of very small structure. However, for liquid samples, in homogeneous or colloidal suspensions, the small collection volume in micro-Raman system can result in under-sampling of the liquid sample, leading to inaccurate and/or false signals. Technospex Pte Ltd offers a new cuvette holder attachment to our uRaman to overcome the undersampling issue. 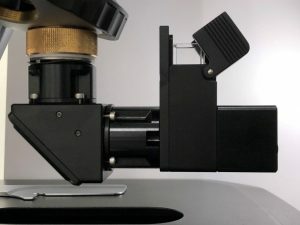 Our new cuvette holder is a simple, low cost and ingenious accessory that allows uRaman micro-Raman users to perform bulk Raman measurements in the form of liquid or powder in a cuvette (Figure 1). Our cuvette holder is highly versatile, and can accommodate the commonly used quartz (preferable) or plastic (low cost) cuvettes used in UV-vis measurements. The design of our cuvette holder focuses on increasing signal collection volume by at least 2- 4 times, therefore obtaining reliable and representative Raman signals from the samples. Our cuvette holder can be attach and remove from the microscope’s revolving nosepiece effortlessly with no further alignment needed. In this application note, we demonstrate that reproducible Raman signals can be obtained using our new cuvette holder for solvent Raman analysis (e.g. IPA, ethanol), glucose (powder and solution) and non-homogeneous nanoparticle suspension (e.g. SERS-active silver colloidal solution). The first examples are the Raman measurements of common solvents, i.e. ethanol and isopropyl alcohol (IPA, Figure 2A). Distinctive Raman signature of IPA and ethanol can be observed at ~819 cm-1 and ~883 cm-1, respectively. The second example is the comparison of the Raman signals of solid and solution form of glucose from Glucolin®. This can be done by filling our cuvette with Glucolin® powder and/or solution. 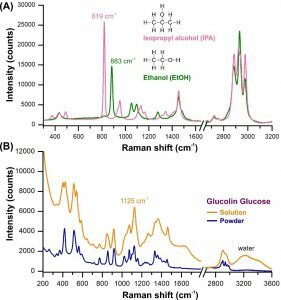 The powder and solution spectra of Gluocolin® share the main Raman signature at ~1125 cm-1 peak, which is commonly used to identify glucose (Figure 2(B)). Figure 2 (A) Raman spectra of ethanol and isopropyl alcohol (IPA) measured using cuvette attached to a uRaman-532 system using Technospex’s cuvette holder. (B) Raman spectra of power and solution forms of Glucolin® glucose in a quartz cuvette attached to uRaman-785. The third example is the Raman measurement of silver colloidal suspension as surface-enhanced Raman scattering (SERS) platform. Generally, bulk nanoparticle solution is placed in a cuvette for UV-vis spectroscopy measurement of its extinction (hence the localized surface plasmon resonance (LSPR)). Now, researchers can use the same cuvette to evaluate the SERS performance of their SERS-active nanoparticles using our new cuvette holder. The colloidal SERS platform consists of silver nanoparticles (Ag NP, diameter < 20 nm) functionalized with 4-mercaptobenzoic acid (4-MBA). The 4-MBA forms a well-packed self-assembled monolayer on the Ag NP’s surfaces and yields distinct Raman peaks at ~1078 cm-1 (in-plane ring breathing + C-S stretching) and ~1594 cm-1 (total symmetric stretching mode of aromatic ring), respectively. These signature peaks of 4-MBA are commonly used as Raman probe molecule (SERS reporter). Figure 3 shows the (A) scattering images and (B) SERS spectra of 4-MBA-functionalized Ag NP solutions under the illumination of 532, 633, and 785 nm lasers. The SERS signals are stronger when illuminated under 532 nm and 785 nm lasers as compared to 633 nm. The higher SERS enhancement can be attributed to the incident laser excitation being in resonant with the LSPR mode of Ag NP. Therefore, for SERS platform, it is more important to select the right excitation wavelength that can effectively excite the LSPR mode of the nanoparticles. Figure 3 (A) 4-MBT-functionalized silver nanoparticle solutions illuminated under (i) 532 nm, (ii) 633 nm, (iii) 785 nm lasers, and (B) their corresponding Raman spectra, respectively. Acquisition time is 1 sec for all three wavelengths. Technospex’s new cuvette holder is a simple, low cost and ingenious attachment that allows Raman user to perform Raman measurements of liquid samples. It is a “must have” accessory to expand the range of samples that can be performed for micro-Raman user. Our cuvette holder attachment offers effortless attachment and removal to/from the microscope with no alignment necessary. We thank Professor Ramon Alvarez-Puebla, Universitat Rovira i Virgili, Spain for providing SERS colloidal solution. PLOS ONE 2012, 7, e48127. Sci Rep 2016,6,29014. Materials Today 2012,15 (2), 16-25.